A small tree to 33 ft (10 in) high, with spreading branches, the guava is easy to recognize because of its smooth, thin, copper-colored bark that flakes off, showing the greenish layer beneath; and also because of the attractive, "bony" aspect of its trunk which may in time attain a diameter of 10 in (25 cm). Young twigs are quadrangular and downy. The leaves, aromatic when crushed, are evergreen, opposite, short-petioled, oval or oblong-elliptic, somewhat irregular in outline; 2 3/4 to 6 in (7-15 cm) long, I 'A to 2 in (3-5 cm) wide, leathery, with conspicuous parallel veins, and more or less downy on the underside. Faintly fragrant, the white flowers, borne singly or in small clusters in the leaf axils, are 1 in (2.5 cm) wide, with 4 or 5 white petals which are quickly shed, and a prominent tuft of perhaps 250 white stamens tipped with pale-yellow anthers. The fruit, exuding a strong, sweet, musky odor when ripe, may be round, ovoid, or pear-shaped, 2 to 4 in (5-10 cm) long, with 4 or 5 protruding floral remnants (sepals) at the apex; and thin, light-yellow skin, frequently blushed with pink. Next to the skin is a layer of somewhat granular flesh, 1/8 to 1/2 in (3-12.5 mm) thick, white, yellowish, light- or dark-pink, or near-red, juicy, acid, subacid, or sweet and flavorful. The central pulp, concolorous or slightly darker in tone, is juicy and normally filled with very hard, yellowish seeds, 1/8 in (3 min) long, though some rare types have soft, chewable seeds. Actual seed counts have ranged from 112 to 535 but some guavas are seedless or nearly so. 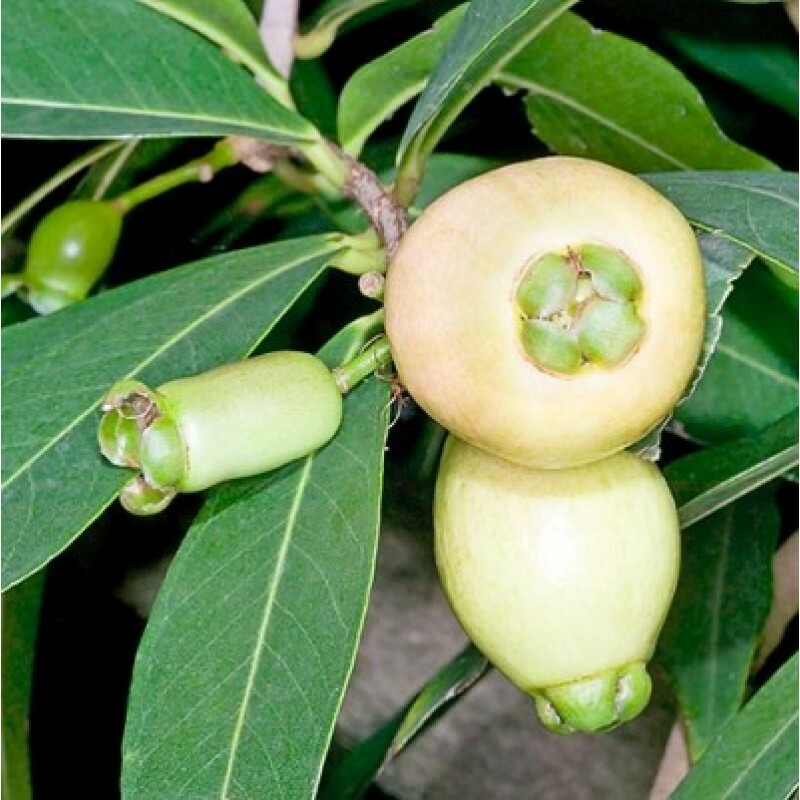 When immature and until a very short time before ripening, the fruit is green, hard, gummy within and very astringent.